﻿ Shred Assured Palm Beach Florida Secure Mobile On Site and Off Site Document Destruction and Paper Shredding Service - Florida Paper Shredding and Data Destruction Service Territory. 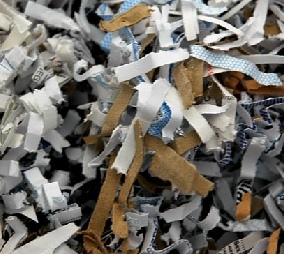 Shre dAssured provides Confidential Document Destruction and Paper Shredding Services to clients throughout South Florida. Whether you are looking to for a one-time purge of computers, documents, folders, and records or regularly scheduled services, we offer the highest level of security and the best value in the market. Period. ShredAssured also works with a network of secure service providers that can service other areas in the state of Florida and throughout the United States, with centralized billing through us, if desired. Please click here to contact us for further information. St. Lucie: Port St. Lucie, Fort Pierce, Jensen Beach. Martin: Stuart, Palm City, Port Salerno, Hobe Sound, Indiantown, Jupiter Island, Ocean Breeze Park, Sewall's Point. Palm Beach: Atlantis, Belle Glade, Boca Raton, Boynton Beach, Briny Breezes, Canal Point, Cloud Lake, Delray Beach, Glen Ridge, Golf, Greenacres, Gulf Stream, Haverhill, Highland Beach, Hypoluxo, Juno Beach, Jupiter, Jupiter Inlet Colony, Lake Clarke Shores, Lake Park, Lake Worth, Lantana, Loxahatchee, Manalapan, Mangonia Park, North Palm Beach, Ocean Ridge, Pahokee, Palm Beach, Palm Beach Gardens, Palm Beach Shores, Palm Springs, Riviera Beach, Royal Palm Beach, South Bay, South Palm Beach, Tequesta, Wellington, West Palm Beach. 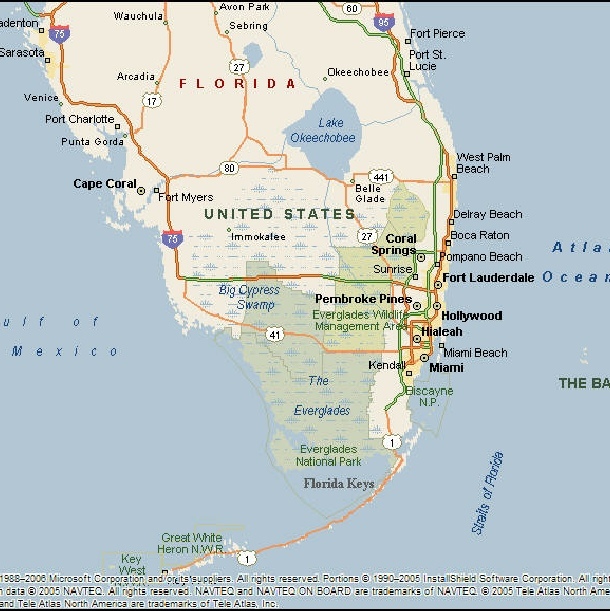 Fort Lauderdale, Hallandale Beach, Hillsboro Beach, Hollywood, Lauderdale Lakes, Lauderdale-By-The-Sea, Lauderhill, Lazy Lake, Lighthouse Point, Margate, Miramar, North Lauderdale, Oakland Park, Parkland, Pembroke Park, Pembroke Pines, Plantation, Pompano Beach, Port Everglades, Sea Ranch Lakes, Southwest Ranches, Sunrise, Tamarac, Weston, Wilton Manors. Miami-Dade: Aventura, Bal Harbour, Bay Harbor Islands, Biscayne Park, Coconut Grove, Coral Gables, Cutler Bay, Doral, El Portal, Florida City, Golden Beach, Goulds, Hialeah, Hialeah Gardens, Homestead, Islandia, Kendall, Key Biscayne, Leisure City, Medley, Miami, Miami Beach, Miami Gardens, Miami Lakes, Miami Shores Village, Miami Springs, North Bay Village, North Miami, North Miami Beach, Opa-Locka, Palmetto Bay, Pinecrest, Pinewood, Princeton, Richmond Heights, South Miami, Sunny Isles Beach, Surfside, Sweetwater, Virginia Gardens, West Miami, Westchester, Westwood Lake. Monroe: Big Pine, Islamorada, Key Colony Beach, Key Largo, Key West, Layton, Marathon, Sugarloaf Key, Tavernier. Collier: East Naples, Everglades City, Golden Gate, Immokalee, Marco, Naples, Naples Manor, Naples Park, North Naples, Ochopee, Palm River Estates. Lee: Alva, Boca Grande, Bokeelia, Bonita Springs, Captiva, Cape Coral, Estero, Fort Myers, Fort Myers Beach, Fort Myers Shores, Fort Myers Villas, Lehigh Acres, North Fort Myers, Page Park, Pine Island Center, Punta Rassa, Sanibel, San Carlos Park, St. James City, Tice, Waterway Estates. Hendry: Clewiston, Harlem, La Belle. Glades: Buckeye Ridge, Ortona, Palmdale, Lakeport, Moore Haven. 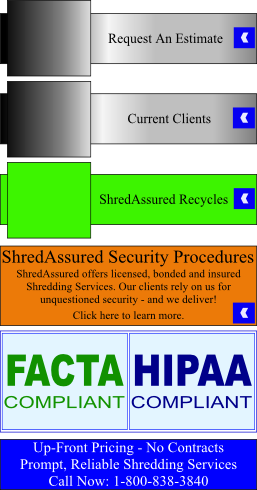 Please click here for more information or give us a call at 1-800-838-3840 to find out how ShredAssured can help your company save money, protect its information, and comply with federal and state laws. 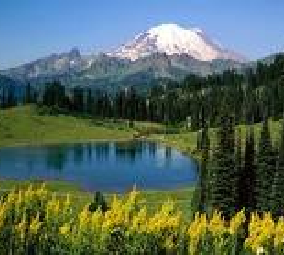 Our client specialists are ready to assist and willing to help in any way they can.